It’s a little funny to think so much of your financial well-being rides on a simple three digit credit score. Yet there’s nothing simple about the way the biggest financial institutions determine this number. The Fair Isaac and Company (you’ll know them better as FICO) relies on an elaborate credit scoring algorithm to place you into one of five categories: bad, poor, fair, good, and excellent. A bad credit score is no laughing matter; it’s tragic considering the power it has over your life. Even the low-end of fair can do harm to your future, as your score is used by everyone from lenders to landlords to determine your creditworthiness — too low of a score and your bid for a mortgage or new apartment is denied. By name alone, you know you don’t want bad credit. What’s less obvious is how easy it is to sink into this rating. Just a few bad decisions can lead you to a score that closes the doors to many essential financial opportunities. If you’re worried that your financial habits are doing more harm than good, take a look at this guide and avoid these common mistakes. Since your very first credit card and student loan — one you may still be paying off decades later — you’ve been building your credit history. This is an account of the various financial products you’ve used in the past, and it acts as an official record of your performance as a borrower. Creditors will look at both the length and quality of the credit you’ve amassed, favoring older histories with positive instances of credit. 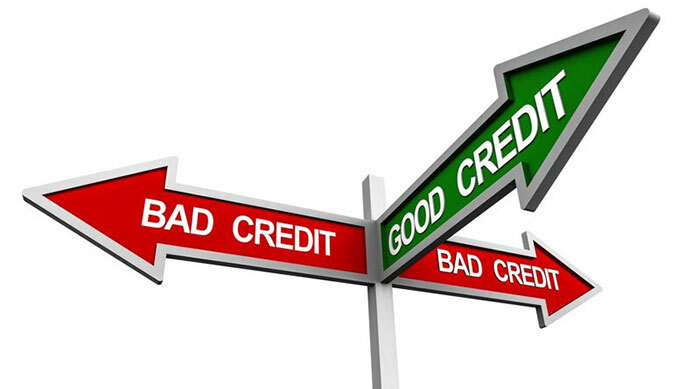 Many people hold off applying for things, thinking no credit is preferential to bad credit, but in many ways no credit can bar you from the same opportunities as bad credit. Though it may seem like a good rule of thumb to avoid loans and credit cards outside of your means to repay, waiting too long to start your history can also impact your score negatively. Organizations can’t determine your creditworthiness if you have no history. The due dates of your various bills are inflexible. You have until the date shown on your bill to send in your payment, and failure to meet these deadlines can affect your score negatively. A late payment of only a few days is unlikely to upset your 3-digit number, but a delinquency of 30-days or more causes your score to nosedive. The longer your debt goes unpaid, the more damage it causes to your score until your creditor charges off. In a charge off, your creditor gives up on collecting what’s owed and writes off the amount as a loss. A charge off is one of the worst outcomes for your financial history. It indicates to others you have a problem meeting deadlines, and it can last on your record for as long as 7 and a half years. Several charge offs will lead to this: the worst case scenario for those unable to pay their bills. For individuals, it involves a process whereby you appeal to the courts and prove you’re physically unable to repay your debts. Once your file is granted, you’ll have to liquidate your assets, including your house and belongings, in order to cover your debts. You may also have to sign an income payments agreement which promises wage garnishments to help pay off remaining debts. As the worst item to have in your credit history, bankruptcy can last on your history for up to 10 years. Credit utilization is another dynamic affecting about one-third of your FICO score. It reports on how you use your credit in a way that’s different from your repayment success rate. Utilization reveals how much you rely on financial products like a credit card or personal line of credit. The utilization rate is determined by how much of a balance you maintain compared to its limit. Each loan in your name has its own rate which contributes towards your ratio of balance to available credit. The higher your balance, the more it affects your score negatively. Applying with Credit Karma or Equifax to check your score won’t damage your credit. Considered soft inquiries or pulls, these assessments are used by individuals or companies as a form of a background check. For the most part, they aren’t recorded on your credit score and they can happen without you even knowing. A hard inquiry, on the other hand, will affect your credit. These are completed by financial institutions like a bank or credit card company, and it’s used to determine whether or not they should accept your application for a loan. One slew of applications at a time suggests you’re shopping around for the best rates, but consistent hard inquiries into your credit could indicate financial failures. Though most of us have embraced online banking, the fact remains many of us still write checks for large payments like rent. A single bounced check won’t do much to affect your score, especially if you right the wrong by paying the person or organization in question quickly after it bounces. A consistent history of insufficient funds left unresolved for multiple billing cycles, however, will show up on a credit check in the form of a delinquent account. Any longstanding account in good standing (for example, a credit card you never use with a large limit) will contribute to your overall history. When you close these accounts, you erase any of the good credit these cards have produced in your name. It will also disrupt your credit utilization. Remember, this rate is determined by comparing how much you owe to the total credit limit at your disposal. By getting rid of a large line of credit or credit card, you lower your overall credit limit. Since your combined balances remain the same, your credit utilization rate will increase. As we explore the many bad habits that impact your credit score negatively, a theme emerges. Though they use an elaborate algorithm to assign you a number between 300 and 850 — and a label like good or bad — a financial institution like FICO ultimately assesses your financial stability as a borrower. However you manage your finances day to day, long term consistency earns you top marks as it proves to creditors you can handle your finances. If you’re guilty of these bad habits, chances are you have a less than stellar credit score. Don’t worry — there’s a silver lining. Your score is an eternally revolving door. Eventually, even bankruptcy is wiped clean from your record. Determine what you need in order to pay bills on time, limit your credit utilization, and maintain good accounts. Eventually your three-digit number will work in your favor. I made some of these mistakes for sure. First, I waited far too long to build credit. I just thought it was something I didn’t need. I always paid cash for everything. I had old medical bills in collections and a junk score. Then I had a family and we needed a house. I made some big financial changes including repairing and rebuilding my credit into a powerful file of many credit cards and paid off loans. Credit is important if you ever want to mortgage a house. It has become much more important since the mortgage collapse in recent years. Revolving credit card utilization is graded even more harshly lately. Where before 60-70% was a red flag now 10%+ is a yellow flag and 30%+ is a major score dropping red flag. I ran a card up high on a business trip and had another cancel my credit line when I came back due to utilization too high on the other account at a different bank! Authorized user accounts are not as powerful as they once were. However, with that said, they are still a great way to boost your credit score. I was able to get a few authorized user accounts by asking friends and family. One has a 15-year credit history, another 12, and one more with at least 5 years. This additional positive credit history helps my score stay higher and overall utilization stay lower.